yes, that's right, kids - livin' the high life. 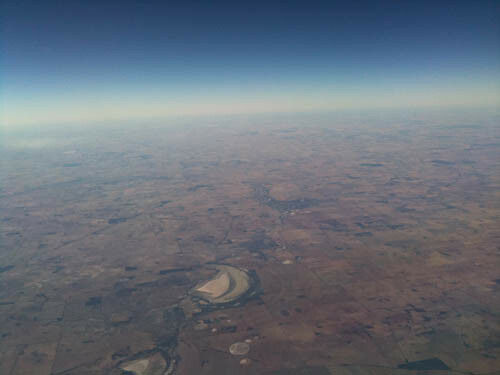 no, really, i'm here to do a residency with some properly amazing peeps - more details can be revealed later on - and already perth is proving to be an interesting little place for me to hole up in over the melbourne winter. and it seems that all the travel i did last year has actually given me a method-of-sorts for arriving and adapting to new places. i say this because, even though i've only been here for about 3 hours, i feel like i'm getting an OK sense of the place and of course myself. both of which help when you're trying to land and morph into a new city/town/universe. firstly, I catch PT into the city from the airport (as much as possible), because i get to interact with and observe the public nature from the get-go: the system of exchange, etiquette, language, road systems and priority - all subtle cultural stuff that doesn't make it onto the wallpaper guide app. today the bus driver told me to take my luggage all the way to the back 'cos the bus would be fulla pushers. he was right - young mums going into town for late-night shopping. that told me loads about the area where they all got on and some of the mercantile customs of perth. secondly, i walk as much as i can. tonight i walked from downtown st. georges terrace to northbridge, crossing through the guts of town as everyone was leaving work and milling about. i had a chance to take note of dress codes, uni students, suit hangouts and where the trains go at peak hour. i feel like i've got the beginnings of a geo-cultural layout happening, which helps. i was also quite pleased to discover a few bookshops not far from here, a stack of cheap/rad asian eateries (open late) and the perth outré gallery. huzzah! once i arrived in my new digs, i unpacked and hilariously discovered a stack of things about myself that i hadn't quite noticed before. turns out i'm into jackets and totes. i have brought with me seven (yes 7!) 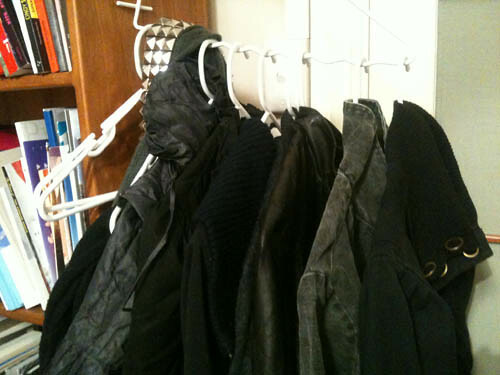 varieties of a black waist-length jacket and 4 calico/cotton totes. 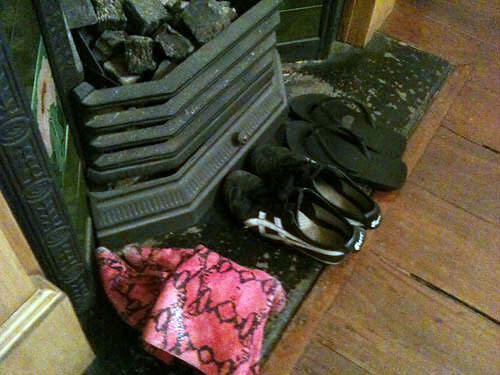 i don't own stacks of shoes (i commit deeply to my shoes, so love them until they're ruined - rather than flitting between them), but i learned what i consider important by the shoes i did chose: my usual tiger trainers, a pair of flip flops and my arse-kicking pink fakeskin stiletto boots. i also filled half my suitcase with possible art materials and tech bits'n'pieces - headphone bits, a door chime i want to hack, paper, gouache, jewellery bits, a tripod, camera and a mini toolset. 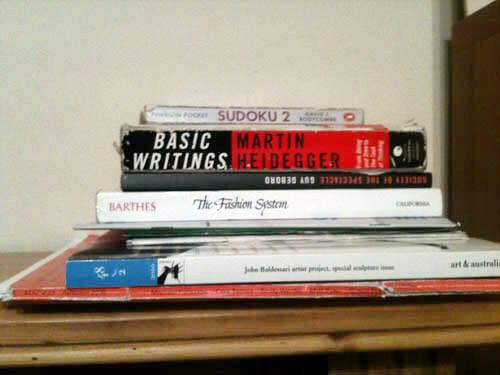 and with my precious luggage restrictions i've squeezed in a small (and restrained) stack of well-worn books (heidegger, debord, barthes) and mags (map, art&au, premsela) plus 3 journals and my daily planner. all the vital things. and there's a little thing i now take with me on every art jaunt: the 5 balls that are the header for this blog. 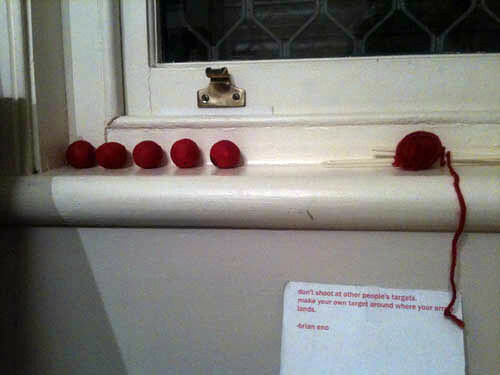 i made them when i was in the UK and had them up in my room here. i took them with me to berlin, not quite sure why, but when i packed them automatically this time, i realised that they have become a little token - a totem for some of the underlying stuff that happens on this blog and some of the inexplicable feelings i have about myself and my arts practice. can you go and see that big wave rock thing and tell me if it's cool? funnily enough, rob, i went to a bookstore yesterday to look for a history of perth via its notorious criminals. i don't know about this particular murdering taxi driver (there was one from the 60s i think), but i'll make sure i'm safe. ish.